In the event of an Ebola epidemic, survivalists have advised how to avoid becoming infected (above, health workers in Monrovia, Liberia). Stocking up on drinking water and avoiding all human contact are among steps that will have to be taken to avoid an Ebola epidemic, survivalists have warned. To avoid contracting the deadly virus people will have to barricade themselves in their homes if the infection spreads, they say. Their advice comes as sales of protective clothing and home infection control kits rise with an increasing number of people fearing the worst. 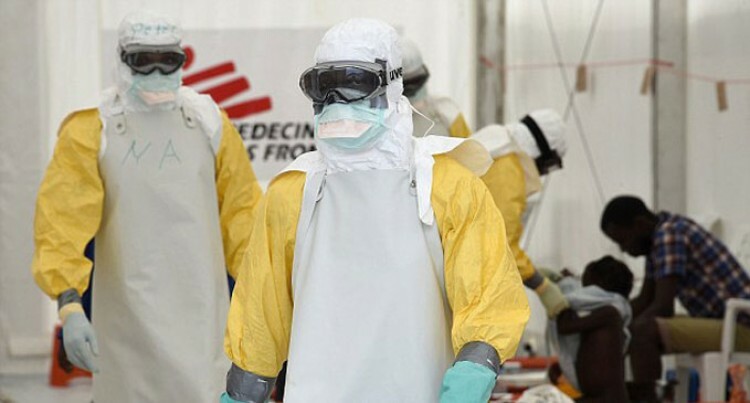 Around 4000 people have died after contracting Ebola which broke out in western Africa in March. While the threat of an epidemic in the UK remains low, experts have warned those who have a good chance of surviving an outbreak must prepare now before it is too late. One survivalist, known only as Steve, said among the ways to stay safe in the worst possible scenario is to avoid all human contact. “If this virus were to really get hold it would expand exponentially and result in a very big mortality rate,” Steve said. “That being the case – the number one preventative method is to put as much distance between you and any infected person as possible. “To have half a chance of surviving an epidemic you must be prepared for the worse, well before it actually hits us in bigger proportions. Steve, who runs the country’s most popular survivalist website, UK Prepper Guide, added Brits would have two options if struck with an epidemic – ‘shutting in’ or ‘bugging out’. Shutting in means staying at home to wither the storm. To be able to do this, families must stock up on long-lasting, dehydrated foods and water. While Ebola is not a water-based disease, if those involved with water distribution became infected, the national water supply would be at risk, Steve added. “Remember, if an epidemic were to occur, you would not want to leave your home and go shopping! “As this is not a water or air borne virus, you can still safely drink your tap water, so stocking up there isn’t really a priority. “However, what about the people who run the water plants and the electrical systems? If they were to be infected it could lead to the infrastructure becoming compromised. “Remember the simple things – toilet rolls (essential) for at least a month, sanitising gel and wipes, any medication you require (at least a months supply). Bugging out involves fleeing to an uncontaminated area to escape threats of infection. If this is the method chosen, survivalists must have a ‘bug out bag’ prepared at all times and a full tank of petrol to flee at a moment’s notice. “Bugging out is really the final straw and, to be honest, not many people would last more than a few days. Your ‘bug out bag’ would contain essential medical supplies, first aid kit, cash, (as this may be your only way to get things), camping and cooking equipment, some dehydrated foods and water. “Having prepared for this or any other disaster must be done well before that disaster strikes. “You must have a plan for staying and a plan for leaving your home – supplies to last and essentials to go. “If your serious about surviving an epidemic and want to give yourself the best odds – then you’d better start prepping now,” he added.